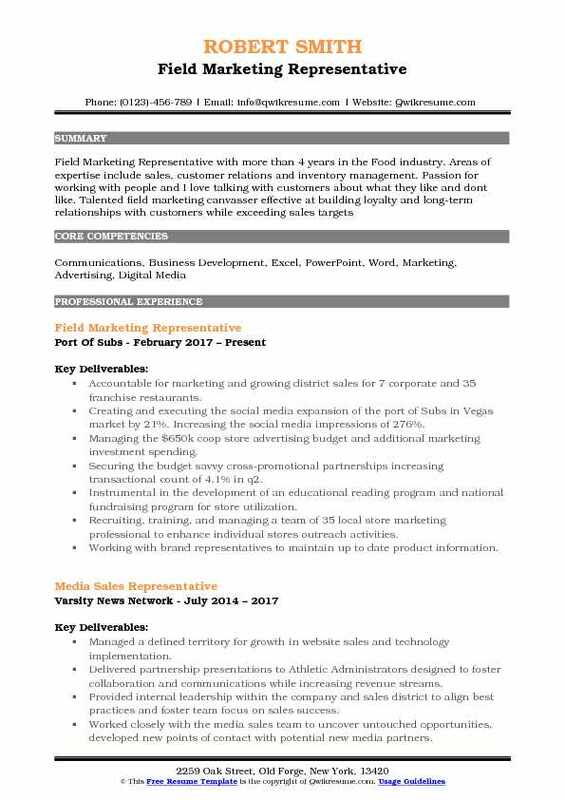 Field Marketing Representative is responsible for designing, implementing and executing of field marketing campaigns, they work closely with the sales team and marketing managers to promote the lead generation and enhance selling probabilities. 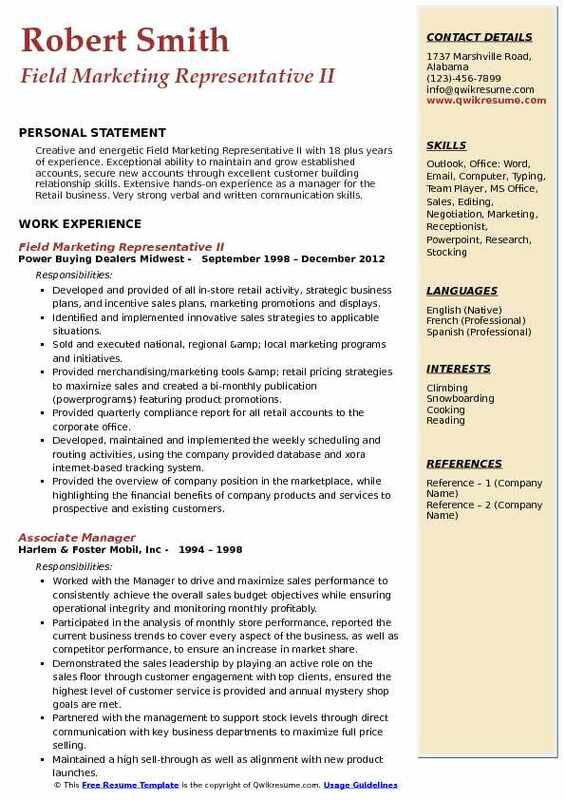 Primary responsibilities mentioned in the Field Marketing Representative Resume sample include – generating new customers through webinars, emails, meetings, assisting in developing effective campaigns, developing good relationship with current customers to repeat business, developing marketing collaterals, website content, generating and evaluating metric reports, participating in meetings and sales conference and discussing with managers regarding marketing tactics and sales strategies. For carrying out field marketing, these representatives need to demonstrate superb written and verbal communication skills; the candidate should also be self-motivated and have time management capability. Field marketing representatives’ post needs a bachelor’s degree in communication, marketing, business administration, economics or its related field. Summary : Senior Field Marketing Representative with 8 years of experience, flexible with the proven ability to work independently and in a team environment and follow the appropriate protocols in maintaining confidentiality. 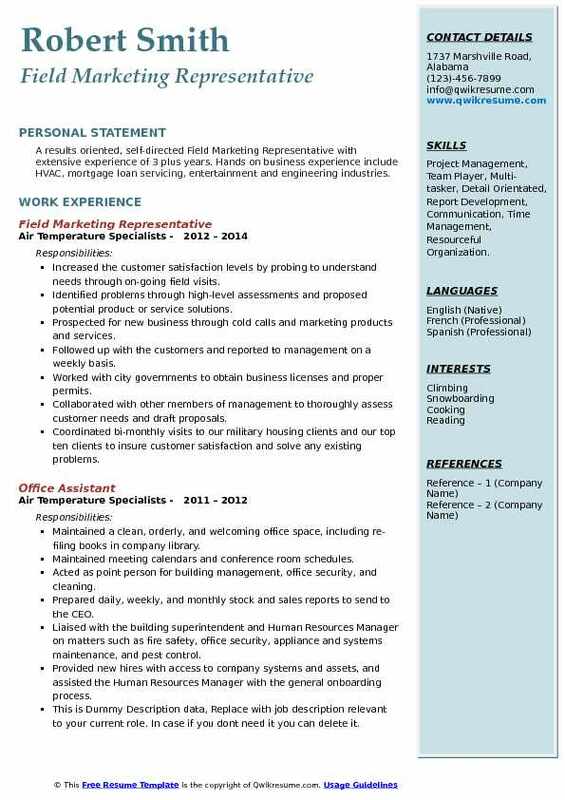 Hard working team player with great communication, organization and dynamic listening skills. Ability to think out of the box and express creative thinking and innovative ideas. Ability to build rapport with internal and external relationships to make leading and lasting impressions. Marketing/sales presentations to the general public for brand advocacy through one-on-one interactions and group forums. Educating, engaging and promoting the sales awareness through merchandising, display maintenance and POP. Field reporting to corporate on competitive information, in-store training, and activities. Point -of-interface for the resolution of compliance related issues with the business unit(s), executive management, account managers, and suppliers. Responding to requested information by ordering, interpreting and clarifying analytical laboratory reports for inefficiencies in order to reply to inquiries. Database management of our suppliers, raw materials, test results, components and finished goods. Successfully interacting with the clients to generate repeat and referral business, resulting in increased product sales. Executing the events from conception to completion including promotional strategy, event logistics, and management of team members. Consulting with the clients after sales or contract signings to resolve problems and to provide ongoing support. 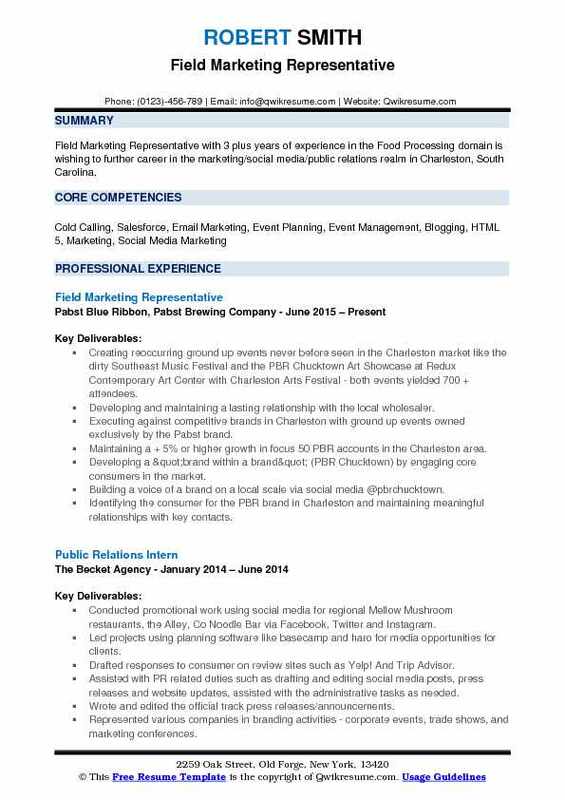 Objective : Field Marketing Representative with 3 plus years of experience in the Food Processing domain is wishing to further career in the marketing/social media/public relations realm in Charleston, South Carolina. Creating reoccurring ground up events never before seen in the Charleston market like the dirty Southeast Music Festival and the PBR Chucktown Art Showcase at Redux Contemporary Art Center with Charleston Arts Festival - both events yielded 700 + attendees. Developing and maintaining a lasting relationship with the local wholesaler. Executing against competitive brands in Charleston with ground up events owned exclusively by the Pabst brand. Maintaining a + 5% or higher growth in focus 50 PBR accounts in the Charleston area. Developing a "brand within a brand" (PBR Chucktown) by engaging core consumers in the market. Building a voice of a brand on a local scale via social media @pbrchucktown. Identifying the consumer for the PBR brand in Charleston and maintaining meaningful relationships with key contacts. Recording and relaying information found in the market in a timely manner to field marketing manager and field marketing director on a strict schedule. Managing and adhering to the personal local field marketing and travel budgets. Overseeing all local PBR marketing strategies and branding efforts independently. 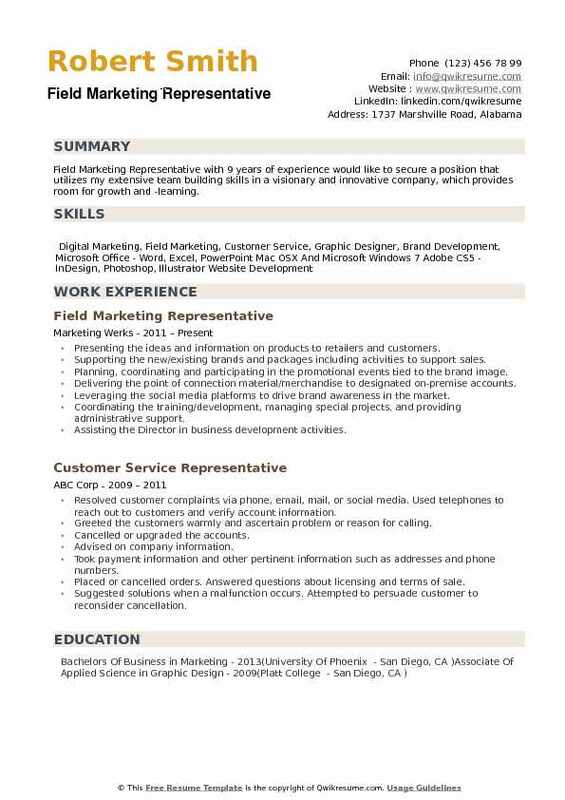 Objective : Tech minded Field Marketing Representative with an experience of 2 plus years in the Retail domain, an experienced background in data entry and receptionist duties as an Admin Assistant, sales and extensive customer service as a Field Marketing Representative, and retail with a mix of commercial driving. Strong proficiency in Microsoft Word/Excel/Power point with 90 average WPM typed. Skills : Microsoft Word, Excel, PowerPoint, Macintosh And Windows Operating Systems, Tumblr, Wordpress, Twitter, Facebook, Foursquare, HootSuite, Instagram, Pintrest, Vine, Some Working Knowledge Of Photoshop. Represented Logitech as a brand ambassador in the Greater Boston area, maximized sales independently within my market by up to 5% monthly. Maintained technical installations of electronic displays with a compliance of 96% fully operational for all 26 assigned best buy stores through proper organization of deadlines. Executed product training sessions for store retail employees on a daily basis. Launched 8-hour product demo campaigns at stores weekly during thriving business. Analyzed monthly sales to provide recommendations and feedback for the senior management and input data entry for daily performance reports to track the effectiveness of marketing objectives. Answered customers questions about products, prices, availability, product uses, and credit terms. Contacted regular and prospective customers to demonstrate products, explained product feature, and solicited orders. 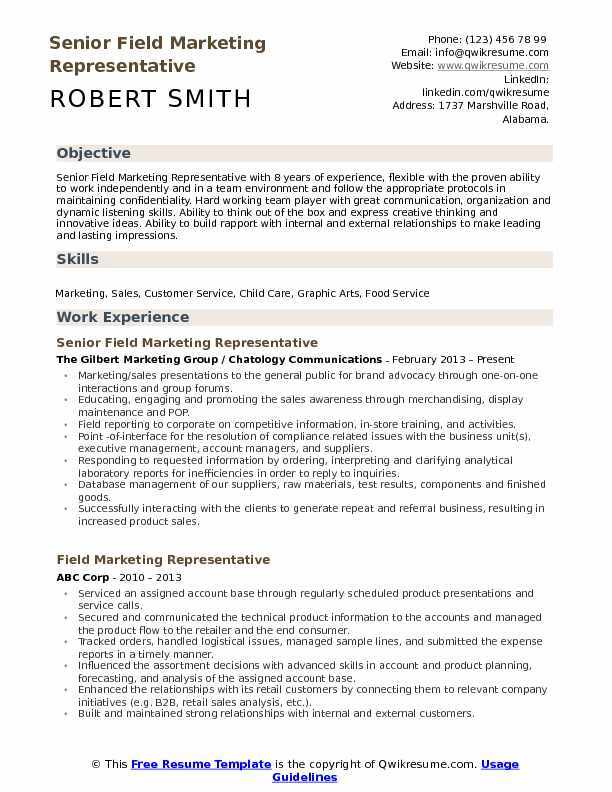 Objective : Junior Field Marketing Representative with 4 years of experience is seeking to obtain a position in the field of Marketing utilizing acquired skills from my education and current job experiences. Consulted 97 Honda dealers to create effective direct response marketing campaigns that drive business for their sales & service departments. Conducted in-person visits every 45 days, requiring 70% overnight travel. Regularly analyzed the overall health of clients, identified areas for improvement & new opportunities for Epsilon products. Directed the interaction with American Honda Zone Managers and field dealer parts & Service Managers. Retained 64 OEM dealership clients by providing proactive consultative services & usage of epsilon’s core products: digital, direct mail, email & live calling VIN specific automotive marketing programs. Efficiently managed territory by conducting in-person visits with the Dealer Principals, General Managers, Service Managers & Fixed OPS Directors within 45 calendar day visitation cycle. Oversaw field relationship with 3 OEM District Managers & field area marketing. Works closely with sales & marketing manager to create programs that will generate quality leads and drive sales revenue. 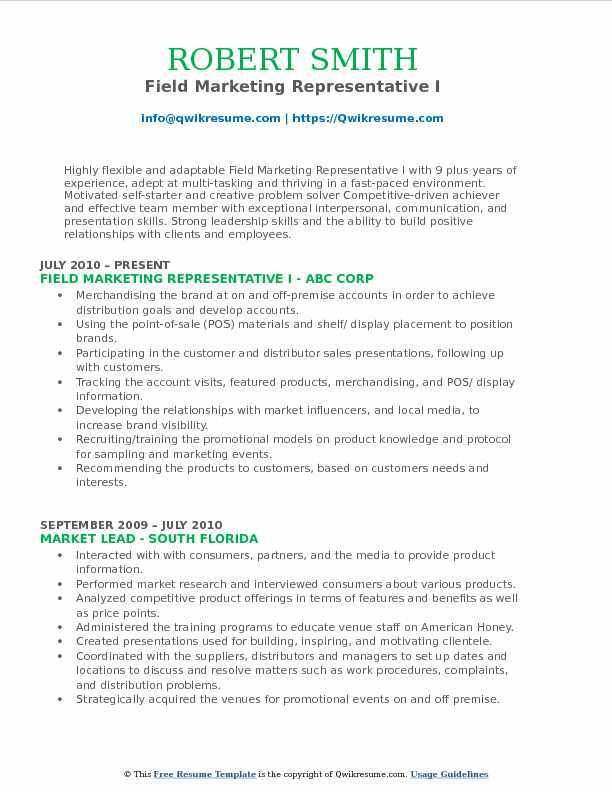 Objective : A results oriented, self-directed Field Marketing Representative with extensive experience of 3 plus years. Hands on business experience include HVAC, mortgage loan servicing, entertainment and engineering industries. Skills : Project Management, Team Player, Multi-tasker, Detail Orientated, Report Development, Communication, Time Management, Resourceful Organization. Increased the customer satisfaction levels by probing to understand needs through on-going field visits. Identified problems through high-level assessments and proposed potential product or service solutions. Prospected for new business through cold calls and marketing products and services. Followed up with the customers and reported to management on a weekly basis. Worked with city governments to obtain business licenses and proper permits. Collaborated with other members of management to thoroughly assess customer needs and draft proposals. Coordinated bi-monthly visits to our military housing clients and our top ten clients to insure customer satisfaction and solve any existing problems. Planned and completed the field marketing campaigns after conducting preliminary research. Designed and developed new customer sales applications and recommended enhancements for existing. Ensured the execution of all corporate consumer propositions, including advertising, promotions, event activation, and PR at the store level. Headline : Previously responsible for growth of Oakley national account business in New York City and the Pacific Northwest I have also personally activated over 300 industry related events over the past eight years; from the Olympics to the X Games and trades shows such as Outdoor Retailer and SIA including acting as tour manager for other brand and product campaigns. Currently I am looking to utilize this experience in a position of growth with room for ownership, creativity and collaboration. Coordinated grassroots and retail marketing efforts in Oregon, Washington, and Northern California. 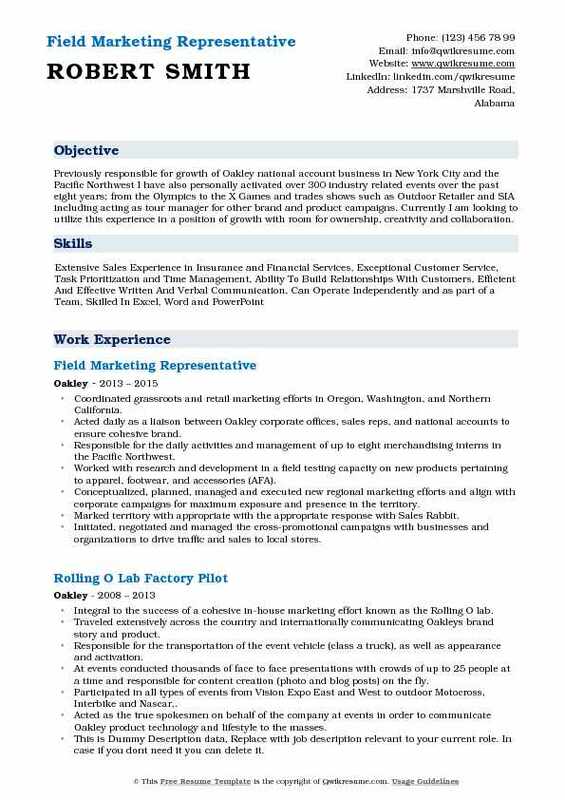 Acted daily as a liaison between Oakley corporate offices, sales reps, and national accounts to ensure cohesive brand. Responsible for the daily activities and management of up to eight merchandising interns in the Pacific Northwest. Worked with research and development in a field testing capacity on new products pertaining to apparel, footwear, and accessories (AFA). Conceptualized, planned, managed and executed new regional marketing efforts and align with corporate campaigns for maximum exposure and presence in the territory. Marked territory with appropriate with the appropriate response with Sales Rabbit. Initiated, negotiated and managed the cross-promotional campaigns with businesses and organizations to drive traffic and sales to local stores. Identified, built, supported and executed the local store and regional market programs and promotions. Summary : Highly flexible and adaptable Field Marketing Representative I with 9 plus years of experience, adept at multi-tasking and thriving in a fast-paced environment. Motivated self-starter and creative problem solver Competitive-driven achiever and effective team member with exceptional interpersonal, communication, and presentation skills. Strong leadership skills and the ability to build positive relationships with clients and employees. Merchandising the brand at on and off-premise accounts in order to achieve distribution goals and develop accounts. Using the point-of-sale (POS) materials and shelf/ display placement to position brands. Participating in the customer and distributor sales presentations, following up with customers. Tracking the account visits, featured products, merchandising, and POS/ display information. Developing the relationships with market influencers, and local media, to increase brand visibility. Recruiting/training the promotional models on product knowledge and protocol for sampling and marketing events. Recommending the products to customers, based on customers needs and interests. Gathering data on competitive products that are sold in the store, to report back to brand management. Encouraging the consumers to fill out a short survey and joining the product mailing. Assisting on and off-premise accounts by selling products directly to consumers in retail stores, to help increase sales. Accountable for marketing and growing district sales for 7 corporate and 35 franchise restaurants. Creating and executing the social media expansion of the port of Subs in Vegas market by 21%. Increasing the social media impressions of 276%. Managing the $650k coop store advertising budget and additional marketing investment spending. Securing the budget savvy cross-promotional partnerships increasing transactional count of 4.1% in q2. Instrumental in the development of an educational reading program and national fundraising program for store utilization. Recruiting, training, and managing a team of 35 local store marketing professional to enhance individual stores outreach activities. Working with brand representatives to maintain up to date product information. 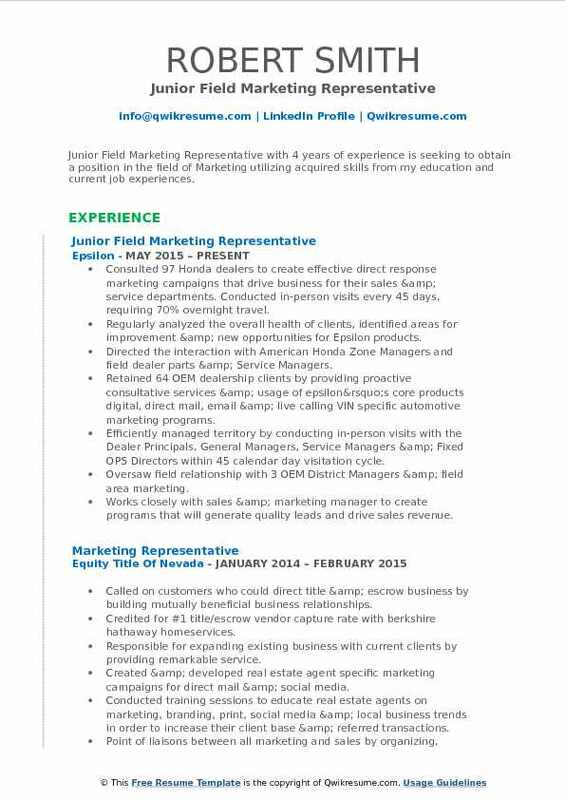 Summary : Creative and energetic Field Marketing Representative II with 18 plus years of experience. Exceptional ability to maintain and grow established accounts, secure new accounts through excellent customer building relationship skills. Extensive hands-on experience as a manager for the Retail business. Very strong verbal and written communication skills. Developed and provided of all in-store retail activity, strategic business plans, and incentive sales plans, marketing promotions and displays. Identified and implemented innovative sales strategies to applicable situations. Sold and executed national, regional & local marketing programs and initiatives. Provided merchandising/marketing tools & retail pricing strategies to maximize sales and created a bi-monthly publication (powerprogram$) featuring product promotions. Provided quarterly compliance report for all retail accounts to the corporate office. Developed, maintained and implemented the weekly scheduling and routing activities, using the company provided database and xora internet-based tracking system. Provided the overview of company position in the marketplace, while highlighting the financial benefits of company products and services to prospective and existing customers. 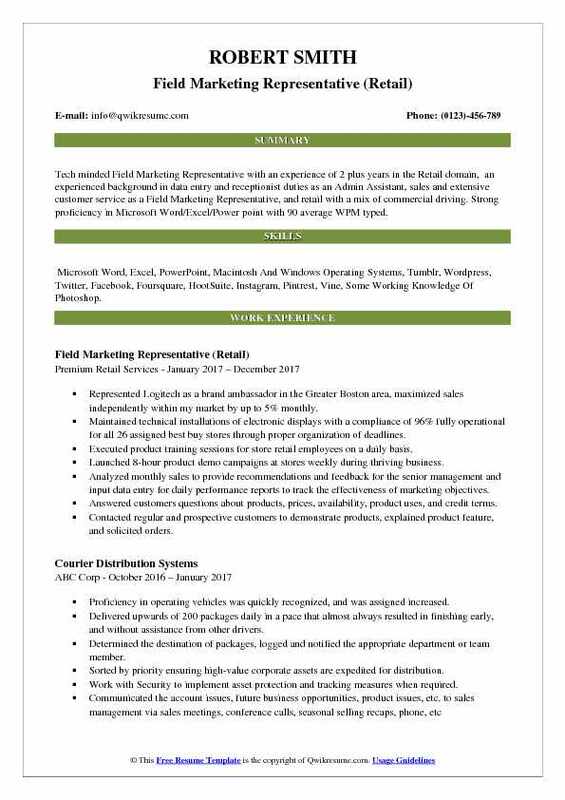 Summary : Field Marketing Representative with 9 years of experience would like to secure a position that utilizes my extensive team building skills in a visionary and innovative company, which provides room for growth and -learning. Presenting the ideas and information on products to retailers and customers. Supporting the new/existing brands and packages including activities to support sales. Planning, coordinating and participating in the promotional events tied to the brand image. Delivering the point of connection material/merchandise to designated on-premise accounts. Leveraging the social media platforms to drive brand awareness in the market. Coordinating the training/development, managing special projects, and providing administrative support. Assisting the Director in business development activities. Reporting all successful and unsuccessful marketing ideas, promotions, and product improvements to the Senior Production Manager. Conducting the training and product demonstrations to retail sales personnel within the assigned territory. Performing the product knowledge training to window treatment sales associates at several store locations and building the strong relationships with store management.